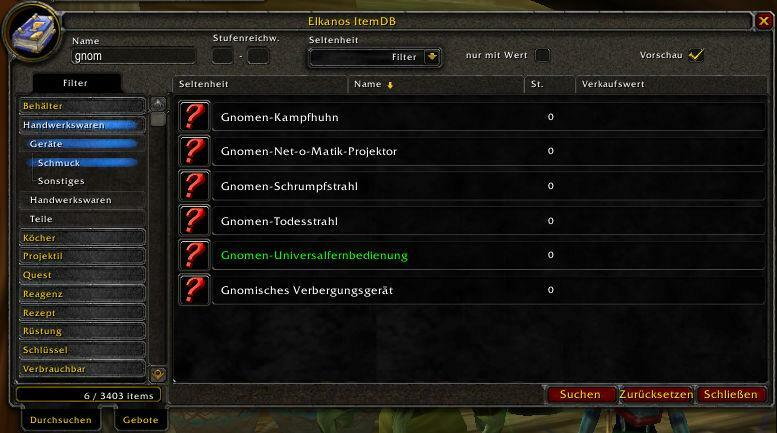 This addon allows you to browse your client's internal item database in order to eg. look at the tooltips or dress up. Be warned that I don't have control over the database so any item pruning is done by the client and is outside of my reach. For now patching to a new version of WoW will prune all items in cache but your client will rebuild a cache of over 1k items very quick. /itemdb -> will open the interface. You use it as you would use the auction house interface. THIS ADDON COMES WITH ABSOLUTLY NO WARRENTY! I'M NOT RESPONSIBLE FOR ANY PROBLEMS IT MAY CAUSE! Shift-Click Search twice to fill the client cache. It will look like the client crashed but it will recover after some seconds. This posting is made of 100% recycled electrons. This addon is not marked for 4.0.1, and that is very accurate despite the fact that it doesn't throw lua errors. I have no idea if Elkano is going to continue developing this addon, but I tracked down serious problems I was having with the latest patch to this addon. Specifically, a ton of items were showing up as "Retrieving item information" and would never finish. I spent a couple hours reinstalling addons one by one until I got to this one and I found the culprit. With a 200 folders in the addons directory, sussing this out was not a simple or quick task. After i updated my ACE addons and installed 2 auction addons last night ItemDB is nolonger working. Last edited by Kerecha : 05-01-07 at 11:31 AM. OKay, thanks, ill see if i can find a way to sort em out from whisperFu. 1. well, the client2client communication is done via whispers since these support item links which I need to confirm valid links. But WhisperFu will possibly allow you to blacklist some message patterns so you could try that. 2. That is 100% intentionaly. Valid items will become invalid when the server restarts. Since I can't check for server reboots, simply not storing the information over sessions is the best way to go. As long as you are logged in, the server hasn't rebooted for sure But with DistChat, valid session items are shared between clients so that as long as there are some people using it it the list of valid items grows over the session. And if you are sure that an item is valid you are still free to link it despite of the warning. Im loving it sofar but with some minor issues. 2: It dosent store logged/comfirmed items between sessions. Wow, it seems the AddOn is a really worthy alternative for ItemSync. I'm impressed! Keep the work up! solved the problem - I'm guessing the error appears because of API changes in KC_Items. should include a keybinding for the itemdb command to open the window. On the version that I have, it does show the actual icon for each item in the window. I don't know why it wouldn't. And second, in the keybindings option, you can set the Database window to a key for easy opening. The last thing I'd recommend is building another persistent DB of items - there are plenty out there. Having a new tab at the bottom of your current window would be a superb way to search. My personal preference is KC_items from Kaelten which would allow searching for any item on any toon whether worn, banked or in their bags. Access to mailbox items is trickier, Possesions and OfflineMail are options here but I'd rank that secondary to worn/banked/bagged. Your current addon does what it does very well and I'd completely understand it if you said that was the extent to which you wanted to develop - I'm just making a suggestion based on something I've been searching for, for a long time. Last edited by Nahkohe : 02-05-06 at 07:01 PM.